Ever since the South Korean president visited the long-disputed Takeshima, or Dokdo, Islands last summer, protests by ultra-nationalist groups against special privilege of Zainichi (long-term Korean residents of Japan) have been escalating in Japan. 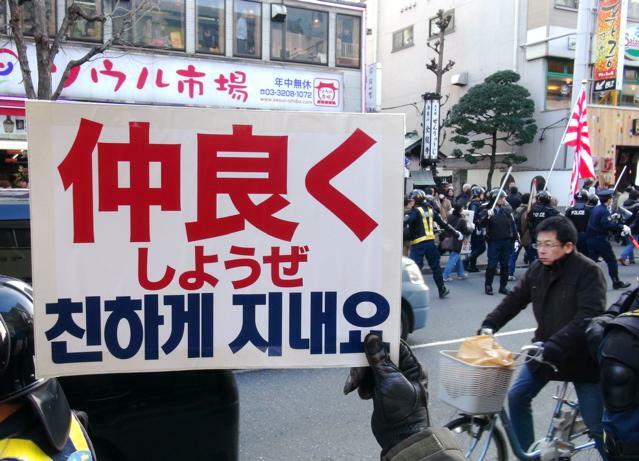 As the groups continued to stage hostile protests in the Korea Town of Tokyo, some Japanese expressed their opinions on the sidewalks in favor of maintaining amicable relationships with Korea and Korean people. 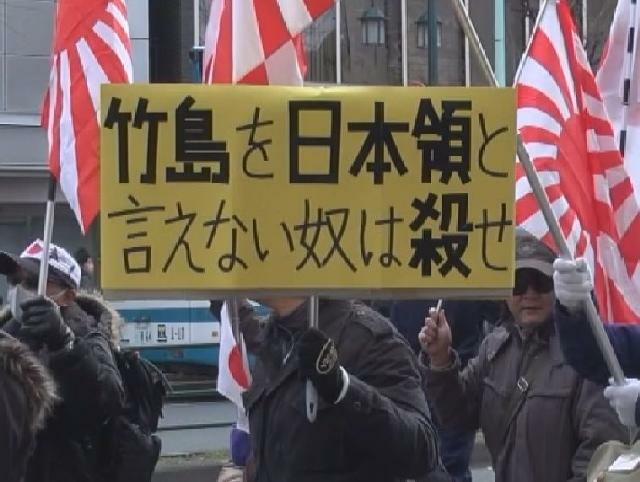 "Kick Koreans out of Takeshima Islands!" "Burn down the whole of Seoul City!" The marchers were chanting as they proceeded. Many were holding large Hinomaru Flags in their hands. Policemen in riot gear were standing along the road. A street demonstration by Zaitokukai, a right-wing group that claim to be protesting against privileges enjoyed by permanent residents of Korean decent, and various other groups and their sympathizers was held again in the evening of Feb. 17 in Shin-okubo, a major Korean Town in Tokyo. These right-wingers have had a series of ween-end Anti-Korea demonstrations in this town. 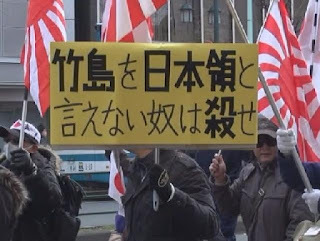 There was however a new development last Sunday: A number of citizens staged protest against the right-wingers' demonstration holding signs that call for peace and friendship. 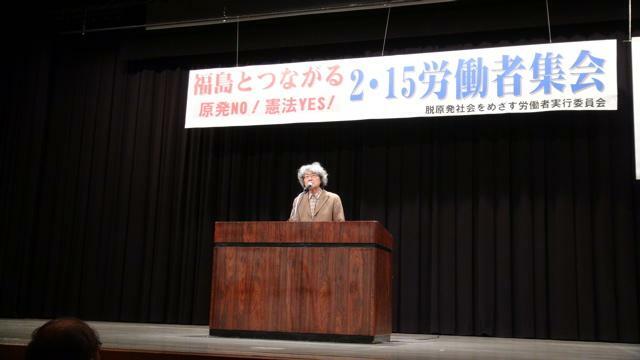 Voice of Fukushima of the Tentcolor Program, Feb. 15: "I Want No One to Have the Same Sad Experience as Mine." The 21st program of Tentcolor, the ustreaming program by the Occupy tent in front of Ministry of Economy, Trade and Industry webcast every Friday since September last year, was aired on Feb. 15, featuring WATANABE Miyoko from Tamura City in the Voice of Fukushima segment. Watanabe, a native of a district of the city about 25 km away from the nuclear power plant, evacuated from her hometown with her grandchildren soon after the disaster and is now renting a house in another district in the same city that is more than 40 km away from the nuke plant. "So many sad things have happened and nobody around me can smile any longer. I've learnt to persevere, but still desire that my hometown and people's lives there will be restored as soon as possible. If it is impossible, I still hope that we be the last ones to experience such a tragedy: I want all the nuclear power plants to be stopped. I don't want the world to be full of sad people like us; that would be the end of the earth. I love the earth seen from the universe that shines blue and I love the people living on this planet. People in the world should help with one another instead of fighting. I want them to stop destroying the mother earth," she said live in the program. "Four of us were packed into one room of 8 tatami-mat size. Food was poor. We had to prepare masks by ourselves. In addition, we did not receive any hazard allowances that the national government must have paid to the original contractors," said two ex-decontamination workers who worked within the evacuation zone of Fukushima No.1 Nuclear Power Plant in their report in the February 15 Workers' Rally in Solidarity with Fukushima that was held in central Tokyo with 480 participants. Major construction firms get orders of decontamination projects, which are subcontracted to smaller companies and then to secondary subcontractors. "The project we worked in was the one gained by a big construction firm located in Tokyo and subcontracted to OZE Corporation, a fully-owned subsidiary of TEPCO. It is absolutely unacceptable for a TEPCO subsidiary to earn from decontamination projects: it is like a doctor intentionally fails to treat patients in order to provide businesses for funeral home owned by himself," said the ex-decontamination workers angrily. 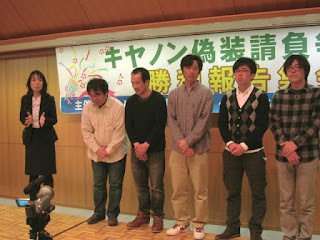 They are members of National Union of General Workers Fukushima Solidarity and fighting for hazard allowances and other requirements that make their life and work decent. 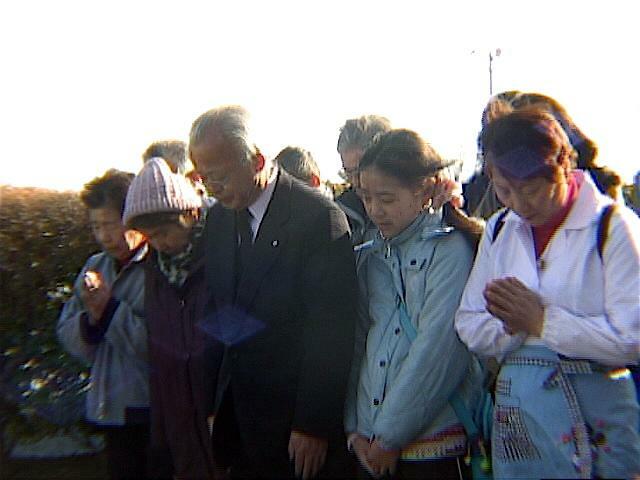 On the 11th of each month, the evacuees from Futaba-machi, Fukushima Prefecture living in the premise of a former high school in Kazo City, Saitama Prefecture, and visiting supporters observe a moment of silence to pay tribute to those who lost their lives in the tsunami of March 11, 2012 and in the evacuation that followed. On Feb. 11, Mayor IDOGAWA Katsutaka (center in the photo) made a farewell speech to those who gathered as usual. "It's been 23 months since the tsunami and nuclear power plant disasters hit our hometown. I have to leave the office without positive development," he started. "I am stepping down, suddenly. I still have a lot that I want to do, but I am forced into a situation where I cannot pursue what I think I should." "I led you to come all the way down to Saitama Prefecture. Here, we have to endure a hard life as evacuees. I have made every effort to let the government hear us and understand that this is not the kind of life we want. If your car is damaged in a traffic accident, you can get a substitute while yours is repaired. But does our life here sufficiently substitute what we used to have back in Futaba? No. We need more humane living conditions where, at least, family members can live together." "It is radiation that is most difficult to tackle with in the problem that we have. Because we cannot see it, we are disguised: we errornously feel we are safe. I have always made warnings not to be disguised and will keep doing so. The resignation does not mean that I will not see you any more: I will keep doing my best with you as an ordinary citizen of Futaba just like every one of you." Then he shook hands with the people there, saying "Take care," or "Don't cry. We'll see each other more often from now on," and tapping their shoulders. The people and the town hall of Futaba moved to the present location in April 2011. There were 1400 residents in the substitute town in the beginning, but many have moved out since then. Less than 100 remain now, most of them are elderly citizens who do not have any other places to go.They have lived in former classrooms and gymnasium in groups without privacy for respective families, being blamed for running away from Fukushima. 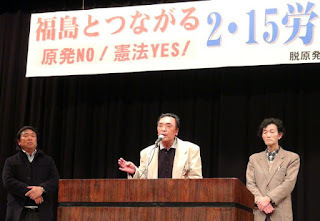 In the autumn session last year, the town assembly decided to move the town hall to Iwaki City, Fukushima Prefecture, but Mayor Idogawa has been opposing to the closure of the make-shift town. "My desire is that the children of Futaba reach adulthood and get married without being impaired by any aftereffects of the nuclear disaster," he told the reporters. "The government ordered us to evacuate from the town without providing any particular guidance or assistance. We had to identify where to and how all by ourselves. It is too inconsiderate for the government to tell us now to return to Fukushima without duly reflecting what they have done, or haven't done, for us since the nuclear disaster." 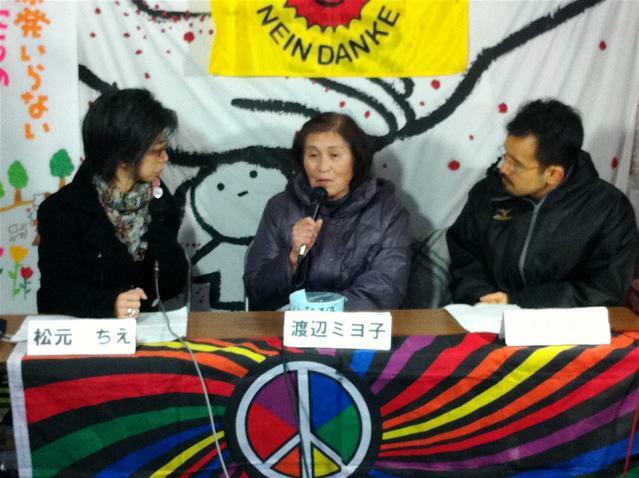 In Japan police have arrested anti-nuclear acrivists. A protest rally against oppression was held in Osaka. Ahead of Chinese New Year celebration to take place on Feb. 10, China has seen outbreaks of disputes over wages and bonuses. Workers at Tokai Rubber Industries, which is headquartered in Komaki City, Aichi Prefecture in Japan, went on strike on Jan. 28 in protest against reduction of year-end bonus. Police mobilized to break up the protest led to violence against the workers and to some arrests. A subsidiary of Japan’s Sumitomo Group, which was established in 2003, manufactures anti-vibration hoses and rubber for automobiles. More than 1,000 people work at the company. The strike at Tokai Rubber is just another worker resistance in China, according to Ellen David Friedman of Sun Yat-sen University. 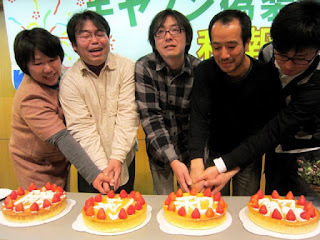 The expert in China Labor visited Japan in January to give a lecture on resistance of China’s workers and what it means to the labor activists around the world. The lecture at Meiji University talked about two important struggles in China: One was a protest against privatization of state-owned enterprise, Tonghua Steel in July, 2009; The other was a strike at transmission manufacturing plant of Honda Motor Corp. in May, 2010. Police was mobilized to break up the protest at Honda factory, but student interns, who were the workers there, resisted for two weeks, which led to cessation of the entire production at Honda plants in China. Workers prevailed to double the wages and rights to vote their worker representatives. The struggle, in the end, triggered an outbreak of strikes throughout China, David Friedman said. A group of 41 mayors, prefectural assembly members and Diet members all from Okinawa landed in Tokyo to file a demand in person with Japan’s prime minister and related ministers. The move makes the first ever attempt by Okinawans.